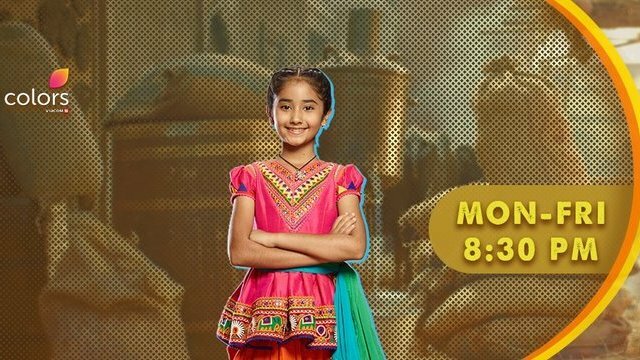 The Episode starts with Bijli buying the hair oil bottle from Kesari by giving her money. Kesari acts at first and then gives the bottle. Bijli asks how to know about usage of this hairoil. Kesari recalls Madhavi’s words. She says you will get long hair if you finish half bottle at once. She fools Bijli and asks her to apply this fast. Bijli says you are useful, thanks. Kesari keeps the money. Madhavi holds her hair and takes her to room. She asks why did you lie again, you are doing a lot of drama, are you not ashamed to lie. Kesari says I know I m lying, but I m sorry, I got caught by Choti Maasa, I got a fake dad but he is using for money, you can beat me and punish. Madhavi hugs her. She asks how did you get this money. Bijli smells the hair oil and says its stinking, how will I apply this, I lost the money, but I have to apply this hair oil so that I don’t lose my hair, how will I do this. Kesari tells everything to Madhavi. Madhavi gets angry. Bijli fixes a clip on her nose and applies the hair oil. Madhavi laughs and calls Kesari mad. Kesari says you look beautiful when you laugh. Madhavi says I m scared for you. Kesari says I m doing this to do something new, I want to make you proud. She apologizes. Zoravar comes home. Choti Maasa asks him to sit for a talk. She says Bijli stays at home, you be with her, give her some time. He says she has complained about me. She says I m your mum and know everything, you don’t know about your wife, she tried to commit suicide. He gets shocked. She asks him to treat Bijli with love. He agrees to get rid of the talk and goes. Bijli says I got a good Saas, I m lucky. She washes Zoravar’s clothes and says Zoravar has to love me now. Kesari pays money to Loha and teaches him what to answer Hanumant. He says if we get caught, we are gone. Loha asks her not to worry, he is fond of acting. Zoravar and Kala are at the dhaba. They drink. They hear Loha saying he has become a father without having a wife and marriage. Zoravar laughs with his friend. He asks for wine for free. Everyone waits for Loha Singh. Kesari says I want to see that boy’s dad. Hanumant says we will call you when he comes. Loha comes there in drunken state. He greets Hanumant and falls in his feet. Everyone gets shocked. Kesari worries. Loha says I have come as fake dad, so I will ask for a price. Kesari gets shocked.